The 2017 Kia Sedona is a vehicle that has improved quite a bit over the last few years. A good size SUV, the Sedona has a responsive 2.0T engine, tighter feel, quieter ride and several features. Our 2017 Kia Sorento test car was equipped with Kiaâ€™s turbocharged 2.0-liter, inline 4-cylinder, with 240 horse and 260 lb. ft. torque. The 2.4-liter inline 4, with 185-horsepower, is standard, and a 3.3-liter, V-6 engine with 290 hp. Is also available. All three powertrains include a 6-speed automatic transmission and can be equipped with front-wheel drive or all-wheel drive. Our test Sorento came with the All-wheel-drive, which proved to be a blessing during the Chicago winter week of test-driving. Sorento received a full redesign for 2016, including new sheet metal, new body structure and the addition of the available turbo inline 4 engine. Gains were also made in interior room, as well as a much more comfortable and accommodating cabin. Ride quality also took a large leap forward, making this a nice road vehicle. Even with a new design, the Sorento didnâ€™t look that different, but minor updates have made this a handsome SUV, and just the right size. Available for 2017 are several trim levels: LX, EX, SX and SXL. Our test EX version (and only the second trim level) with AWD came at what we thought was a pretty steep price, including many options that may or may not be necessary to the average SUV shopper. All has changed for the 2017 Kia Sorento. With more stylish looks, all the trim and sheet metal have been updated. The redesign is noticeable, with ties to its other stablemates; whether you like the new look, or not, itâ€™s keeping up with design cues out there. The interior is a noticeable upgrade; classier and very comfortable. A squarer look and design than the Santa Fe, the Sorento offers a third-row seat. The 2017 Sorento has added about three inches to its length and wheelbase, making for a smoother ride. Competing more with the Honda CR-V and Toyota RAV4, than the 2015 model, the new Sorento responds more powerfully and responsively. The suspension is firm, but not rough or harsh, noise level is improved, with a lighter feel. The Sorento is available in the LX and EX models, most of the market. The EX can be ordered with the turbocharged inline 4-cylinder or V-6 engine. The SX and SXL trim levels are offered only with the V-6. The entry level Sorento L is the base 2.4-liter engine and front-wheel-drive model. Still keeping with Kiaâ€™s wish to offer an affordable SUV. The SX and SXL models come equipped with the Infinity 10-speaker audio system, and upper level trim models getting a full nav system with live traffic. Most trim levels come with the full lineup of UVO eServices capability, Yelp and Pandora apps. We drove the Sorento and 2017 Santa Fe Sport Ultimate 2.0T back-to-back, equipped with the same engine and similar amenities. Both great SUVâ€™s, although the Santa Fe has the better looks. We could be happy with either over the long haul. Similarly equipped, we would probably opt for the Santa Fe; comparing the two exact vehicles we drove in the fleet. The styling appeals more. 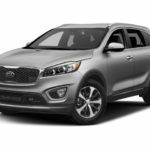 Were there some dislikes in the 2017 Sorento? The back bench seats felt short for those with long legs. The active-safety features are not widely available, and if one thinks of the Kia as a lesser vehicle to the Santa Fe stablemate, perhaps that explains it. Ford/Mercury? Apparently, consumers arenâ€™t able to pair a third-row seat Sorento with the turbo engine, either. Seats have been upgraded to better accommodate tall and short drivers, alike. Leather seat trim is standard on the EX AWD; front seats are heated, power adjusted driver seat with power lumbar support, power passenger seat, tilt and telescopic steering column, steering wheel controls and paddle shifters are standard. 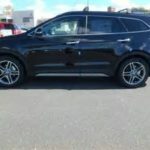 The second row windows came equipped with shades, as with our Hyundai Santa Fe Ultimate trim level. Our test Sorento had several options including a Cargo mat ($95), carpeted floor mats ($130), cargo net ($50), cargo cover ($150), Auto dimming mirror with HomeLink, Compass ($350), interior lighting ($450), illuminated scuff plates ($250), side step bars ($495), tow hitch ($395), EX Advanced Touring Package (chrome roof rails, autonomous emergency braking, lane departure warning system, advanced smart cruise control, electronic parking brake, LED interior lighting, Panoramic sunroof with power sunshade, $2,500); EX Premium Package (power folding side mirrors, passenger auto up/down safety windows, 4.2-in. color TFT LCD meter cluster, blind spot detection, rear cross traffic alert, 110 volt inverter, Smart Hands Free power liftgate, $1,600). A lot of options and we thought, at premium pricing. So much for a lot for your money. EPA Fuel Economy: 19/25/22 mpg. In a world where it seems every vehicle on the road is a sport-utility/crossover, the choices abound, some too big, some too small. By too small, we mean less cargo space than some sedans, and too big, meaning, who wants to wield this behemoth around town on a daily basis. Not this writer. Enter, Hyundaiâ€™s Santa Fe, a popular crossover since itâ€™s inception. I can remember when the Santa Fe first hit the car scene, a colleague found an ad of the Santa Fe, cut it out and tacked it on her memo board in her cubicle. She took a picture of her own face and placed in the ad, in the driverâ€™s seat. She knew exactly what she was going to buy when the time came! Since that time, there are so many more SUVâ€™s on the road. How does one decide? In various ways, I suppose. Brand loyalty, hearsay, looks, options, best deal for the money? Our test car this week, the 2017 Hyundai Santa Fe Sport 2.0T Ultimate AWD might be just the right size. For some reason, to this writer it seemed not as large as the current model. Clearly, itâ€™s size has been increased since the beginning. The 2017 version seems easier to handle and more accommodating to the average-sized driver. The Santa Fe is larger than a compact crossover, yet smaller than a three-row crossover. A five passenger crossover, the new Santa Fe competes with many other offerings, including Chevrolet Traverse, Dodge Journey/Durango, GMC Acadia, Mazda CX-9, Honda Pilot, Ford Explorer/Flex, Nissan Pathfinder and Toyota Highlander. The Santa Fe is available in three trim levels: Sport (FWD: $25,350; AWD: $27,100); Sport 2.0T ($31,700/$33,450); and Sport 2.0T Ultimate ($35,500/$38,280). Larger than a Toyota RAV4, Subaru Forester or others, the Santa Fe seems more useful. If you desire a longer version (adding 5K), there is the Santa Fe (sans Sport), adding a third row, closer in size to the Highlander and Pilot. Starting in the mid-twenty thousand range and topping out here with the $41K is quite a span, and paying over $40,000 for the Santa Fe, as nice as it is (fully loaded), seems extreme. The Ultimate trim, on our test car, is without want, comfortable and handsome, but $41,000? Thatâ€™s how it is in carland today. Sure to be named a Top Safety Pick Plus from IIHS, the new Santa Fe is equipped with all new safety technology, including forward collision prevention, adaptive LED headlights, lane departure (disabled automatically, and part of the Ultimate Tech Package, $1,550). Hyundaiâ€™s 2.0 Turbo 4-cylinder engine provides plenty of power and response, however, has that lag, at times. Te EPA rating, though, is at a combined 19/24/21 mpg. in the all-wheel-drive version. The Santa Fe does run on unleaded, so perhaps there is some savings there. Among the amenities are heated-and ventilated-seats; ten-way power for the driver, leather seating surface/shift knob/steering wheel, heated steering wheel and rear seats. Automatic on/off headlights, LED Daytime Running Lights, fog lights, HID headlights, hands-free Smart liftgate with auto open, heated dual power side mirrors w/turn signal indicators, Panoramic sunroof, RR parking sensors, premium lower door trim and door sills. Manual rear side window shades are standard on the Sport Ultimate, as are multi-view camera system, split-folding rear seating, Integrated Memory System for driver seat and power-height adjustable driver and passenger seats. The ride is much better in the 2017 Santa Fe. We found it harsh in previous models. Bumps are handled well, without any jarring or stiffness. Memory seating is standard on the top-of-the-line Santa Fe; great for multiple drivers. Rear-seat passengers can also adjust their seating, making long trips much more enjoyable. The 2017 Santa Fe takes bragging rights for its cargo capacity: larger than any compact crossover (35.4/71.5 cubic feet). The spare tire can be found underneath the vehicle, freeing up space in the rear cargo floor. Our test car came equipped with a few options, including the Ultimate Tech Package (Smart Cruise Control with Stop/start, Lane Departure Warning, Electronic Parking Brake with auto hold, Dynamic Bending Light, High Beam Assist, Auto-Leveling Headlights, $1,550); carpeted floor mats ($125), Cargo mat ($95), Cargo Cover ($190) and Roof Rack Cross Rails ($250). Perhaps consumers can try and negotiate some of these later options (carpets, etc). At this level of a vehicle, one would think the carpets/mats would be standard. New for 2017 is the latest tech Android Auto (simpler). The infotainment is a touchscreen that is easily operated. Touchscreen Navigation (8-inch), AM/FMHD radio/Sirius XM, CD/MP3 w/Infinity Premium Audio with QuantumLogic Surround Sound and Clari-Fi Music Restoration, Interior light dimming, Homelink and compass, Hyundai Blue Link. Hyundai also provides a full tank of gas! Make sure you get this goodie! The nav and map system is great. The Google maps very helpful, and we had to get used to the surround view camera, but then found it very helpful. As with all Hyundai and Kia products, we highly recommend the new 2017 Santa Fe, in any trim level. With its best-in-the-market warranty, reliability and good looks, choosing to own any of their products is a win. One of our favorite Lexus models, the RC 350 coupe looks as good as it feels. By feels we mean you have a sense youâ€™re driving a â€˜sports’ car, with body-fitting seats and a growl that begets power. The only problem this test-drive Lexus presented was remaining in the fleet during the Chicago winter weather! I should have known the tires on this tester would still be summer tires. But I ventured out in the snow anyway, one blustery night. Not a good idea. I managed to get onto the expressway after dinner and head north, not pushing the accelerator any higher than 30 mph. It was a slippery ride home. Needless to say, I parked the RC in the lot and left it until pick up on Tuesday. I wasnâ€™t taking any chances putting a dent in this beauty. Had this been part of my stable, it sure would have sat out the icy, snowy winter months, protected in a nice warm garage. Hard to know how it would have handled with winter tires, but I would guess, much better. A distinctive looking Lexus, the 2017 RC 350 we tested came in Atomic Silver; not the best of colors for this beauty. We have a neighbor who owns one in the Red and it is stunning. We especially like the RCâ€™s plushy, sport interior and comfortable, Recaro-like seats. The RC 350 does have rear seats, although not terribly fitting for most adults. If youâ€™re wanting to carry luggage or â€˜stuff,â€™ the rear seats fold and split, offering decent cargo space. All-wheel-drive is available on the RC 350 and we recommend it if youâ€™re planning to make this vehicle a year-round driver. We also would like to see one equipped with the optional F Sport package. We especially like the F Sport on the IS 250 compact sedan. 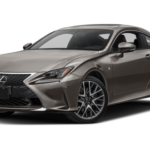 As all Lexus models do, the RC 350 comes equipped with just about all youâ€™ll need in a Coupe, including the usual high-tech safety features, such as 8 airbags, driver and passenger front, knee and side (8) and side curtain (2). Anti-lock braking with electronic-brakeforce distribution and brake assist, stability control, LED headlights and LED running lights, location specific tire pressure monitoring system, forward collision warning/adaptive cruise, and Back-up camera. Dual Chrome Exhaust adds to the look and sound of this Coupe. The driverâ€™s seat is of course, 10-way power, with 2-way lumbar; passenger, 8-way power. Heated seats are available in the Premium package. Other options include park assist, a sunroof, navigation, power tilt-and-telescoping steering wheel and Mark Levinson audio system, with 17 speakers, and leather seating. The Toyota/Lexus Entune system is excellent, complete with a stolen vehicle locator. The RC still has the Remote Touch control pad and some off-center, oddly stacked components. Seems dated, but weâ€™re used to it now. Competition for the Lexus RC 350 includes such established luxury sport coupes as the BMW 4-Series, Mercedes-Benz C-Class and Audi A5. Offered in several trim levels: 200t, 300 AWD (both added in 2016), 350 AWD, each model offers the F Sport option. Are there some dislikes about the Lexus RC350? Just a few. Some may have to adjust to the RC design, but we think itâ€™s beautiful; one has to become accustomed to the carâ€™s newish front end. It took some time, but we think itâ€™s edgy and like it on the other Lexus models. A manual gearbox is not offered on the RC 350; seemingly odd, however, itâ€™s a â€˜luxuryâ€™ sport coupe. Mileage isnâ€™t remarkable, but then would you really expect it in a vehicle like this? When comparing with other Lexus models, one may be surprised at the 19/28, average 22 mpg return. Actually, I get close to 30 mpg in my 2003 Corvette. The RC 350 may not feel as responsive as a purist would expect, but it has some punch. Itâ€™s more growly (?) than expected. Some reviewers would like to see a lighter weight coupe, with a more powerful engine. Points are given, however, for exterior design, steering/handling, seat comfort and interior design. For 2017, the RC 300 AWD and 200t offer triple-beam LED headlamps and standard Scout GPS Link (smartphone app displaying directions on center screen for cars without nav), while the RC 350 has standard performance dampers. The base RC 200t brags best fuel economy and a starting price of $40,000. Not having driven the RC 300 or the 200t, we canâ€™t speak to them in comparison to the RC 350. Compared with the 350s 306 horse V-8, the RC 300 pairs the Lexus 255 horsepower V-6 with a six-speed automatic trans. We found the RC 350 nicely balanced and can only imagine what adding the F Sport package might be like. Transmission: 8-speed electronic autom.-inc Multi-mode and intelligence (ECT-i) with steering wheel-mounted paddle shifters. Options: Windshield Dalbac? And Headlampâ€¦.?? ($220); illuminated door sills ($449), moonroof ($1100), Dynamic Radar Cruise Control w/Pre-Collision System ($500), Premium Package: includes Blind-spot Monitor with Rear Cross-Traffic Alert, Driver/Passenger Heated/Ventilated Seats ($1,240). Warranty: 4 yr/50,000-mile Basic; 6 yr/unlimited Corrosion; 6 yr/70,000-mile Drivetrain, 1 yr/10,000-mile maintenance, 4 yr/unlimited roadside assistance. EPA fuel economy: 22/32 mpg. The year 2017 marks the Toyota Corollaâ€™s 50th Anniversary. Do buyers care? Maybe. But they know the merits of the successful Corolla and sing its praises when thinking â€˜buy for life.â€™ The bestselling car nameplate of all time, the Corolla is historically a reliable, practical and affordable car. This writer has known a handful of first-time Corolla buyers who are still driving that 20-year old model. It would be interesting to interview those die-hard Corolla owners to determine how much styling changes matter. If it does, perhaps the refresh for 2017 that also includes some newly available safety features to the Corollaâ€™s eleventh generation compact will appeal. And if youâ€™re so motivated, you may purchase a special-edition 50th Anniversary Corolla, loaded and featuring a few visual standouts. For 2017, the Corolla lineup changes somewhat: the sporty S trim (we favored) is no longer, and replaced by the SE and XSE trim levels. Moving closer to its big sisterâ€™s offerings, the Corolla resembles the Camry in some ways. A XLE trim gets added to the Corolla lineup, and the L and LE models remain untouched. New safety features for 2017 include a backup camera on all trim levels, darkened headlights on the XSE model, along with a larger wheel and rear lip spoiler. Looking at the 2017 Corolla head on you notice the reshaped grille. Somewhat resembling the Lexus update last year, the front end also gets different headlights, and taillights. Competition is aplenty for the compact segment, and two of the better-looking competitors-Mazda3 and new Honda Civic-outshine the updated Corolla. Hard to compete. Depends, as always, what consumers are looking for: Something that looks updated or is sure to be dependable. New safety features abound on the Corolla and include the Toyota Safety Sense P package; available on any trim level that includes automatic emergency braking, adaptive cruise control, lane-departure warning and assist and automatic high-beam headlights. This stand-alone package demonstrates Toyotaâ€™s commitment to â€˜standard safety suitesâ€™ on all their vehicles by the end of 2017. Hopefully, no one really thinks about a powerful engine when sitting behind the wheel of a compact car. While the Corollaâ€™s engine is peppy and adequate, performance is lacking. The1.8-liter four-cylinder engine is teamed with either the six-speed manual version, or a four-speed automatic, or CVT automatic. Corollaâ€™s mid-cycle refresh offers better safety equipment, great value, more leg room for rear passengers, standard LED headlights and Toyotaâ€™s easily-operated Entune system. This is a vehicle that will get you anywhere, on time and in good stead. Not necessarily true for all vehicle purchases, the Corolla will give you good years of service, will most often start first time, every time, and for a reasonable price. The average public today simply cannot afford to purchase a new vehicle. Most, at an average price of over $30,000 today is a huge purchase for many earnest workers. We truly enjoyed our time in the Corolla this week. So easy to drive, maneuver and park. Thereâ€™s little to dislike. As with most mid-cycle refreshes, pricing shouldnâ€™t change much compared to the outgoing Corolla, which today starts at $18,135 for a base Corolla L with a manual transmission and reaches up to $23,960 for a Corolla S Premium with a CVT, but the new trim designations will surely see some variations in how much content you get for how much money. The most efficient Corolla, the LE Eco, manages fuel economy upwards of 42 mpg on the highway. The rest of the lineup isn’t far behind: between 27 mpg city, 36 highway, and 31 combined and 29/37/32 mpg, depending on configuration. The Corolla could, of course, use a little more power and while the new look isnâ€™t dramatically different, itâ€™s a little more up-to-date. If consumers want to stand out a little in their Corolla, they can opt for the 50th Anniversary Edition, of which only 8,000 will be sold, and in three colors only. They also feature a 17-inch alloy wheel, special floor mats and badges, contrast stitching in Black Cherry color hues on a black interior, and dash and door accents. If you need to add on, two options available are a power moonroof and Entune Premium Audio System with navigation and app suite. The Anniversary edition does stand out some, with a bit of an wedge-look design, angled front shapes and tilted upward window line at each rear door. Opt for the XSE model and youâ€™ll add a blacked-out grille with fog lamps, aggressive air dam and integrated rear spoiler. EPA Fuel Economy: 28/35 mpg., avg. 31 mpg. Seemingly a friendlier SUV to drive than its big brother, the LX 570, the 2017 GX 460 V8 and 301 horsepower competes with models such as the Land Rover LR4, Mercedes-Benz GLE Class, Lincoln MKX, BMW X6 and Jaguar F-Pace. New for 2017 on the GX 460 seems sure-footed on slightly snowy roads, visibility is very good and the ride is comfortable, while high. One can get used to having this overall view of the road; it feels a little safer. As expected, the cabin is very quiet, and for those wanting to tow something, the capacity is 6,500 pounds. Although, we canâ€™t imagine wanting to risk chipping the paint on this luxury boat. The 2017 GX 460 offers available second-row Captainâ€™s chairs, and a new Sport Design Package, including unique exterior styling cures and gray 18-inch aluminum wheels. The GX 460 is available in two trim levels: Base 4×4, $51,280 and Luxury 4×4, $62,980. Notable features on the 2017 GX 460 include the Captainâ€™s chairs, the hourglass style grille, seating for six or seven, available blind-spot warning system, and available Collision mitigation system available, as well as standard full-time 4WD with low range. Standard features on the 2017 GX 460 are many, as expected in any Lexus product. A moonroof, dual-zone automatic climate control, a nine-speaker audio system, Bluetooth, HD Radio, satellite radio, two USB ports, voice command activation, proximity key access, push-button start, a rearview camera, and an infotainment system with an 8-inch touch screen, are all standard. Optional equipment includes tri-zone climate control, a 17-speaker Mark Levinson premium audio system, a dual-screen rear-seat entertainment system, smartphone app connectivity, navigation, blind spot monitoring with rear cross traffic alert, parking sensors, lane departure warning, automatic high beams, adaptive cruise control, forward collision warning, automatic braking, and a wide-view front and side camera system. 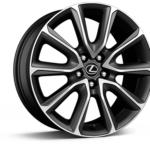 Our Luxury GX 460 came equipped with the new Sport Design Package which includes 18-inch split six-spoke alloy wheels with Gunmetal metallic finish, a very handsome offering. Also included in the package are unique lower grille surround, unique front tip garnish, contoured side mirror covers with chrome, rear valance, deep red taillight graphic, and chrome exhaust tips ($1625). The other option on our test GX was the Driver Support Package with Mark Levinson premium Audio, pre-collision system w/Driver Attention Monitor, Dynamic Radar Cruise Control, Lane Departure Alert, Intelligent High-Beam Headlamps, Wide-view front and side monitor, CRAWL Control, Mark Levinson Premium Audio Surround Sound Audio, $4,340. The 2017 GX seats of three rows is leatherette upholstery. A leather-wrapped steering wheel and shift knob and 10-way power front seats are also standard. Optional seating upgrades include leather seats, heated and ventilated front seats, heated second-row seats, second-row captain’s chairs, a wood- and leather-trimmed steering wheel and shift knob, and a power-folding third row. Our Luxury edition GX had all of the above. We found the GXâ€™s front seats more comfortable than those in the Lexus GS 570. They provide enough comfort for daily driving. We did not experience them over the long haul. The second-row seats are, however, more rigid and harder than expected from a Lexus product. The optional Captain’s chairs might possibly improve second-row comfort somewhat. Passenger room is not a problem in the front two rows, but the third row is tight. The outer seats in the second row have complete LATCH setups, while the middle seat has only a top tether anchor. All the tether anchors are easily located and marked. The lower anchors are too deep in the seat, but we found it easy enough to maneuver. Though possibly somewhat dated, the GXâ€™s standard infotainment system is easy to use and figure out for most. Basic functions are controlled by buttons and knobs that surround the screen and are clearly labeled and easy to reach. Some of the features we didnâ€™t like about the GX 460 include the body roll at low speeds, lack of real comfort in second-row seating, a small third row, and the small amount of cargo space behind the third row. The question remains how many consumers purchase a SUV like the GX 460 with a third row in mind. Certainly, itâ€™s perceived as an â€˜extra,â€™ just in case. But how often a third row of seats is used remains a mystery to this writer. This is a luxury vehicle, after all, and anyone with small children opts for that minivan. 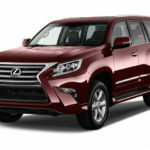 As with all Lexus products, the GX 460 is a beautifully executed vehicle. Those purchasing one donâ€™t expect great fuel economy, so that goes without saying. A vehicle weighing 5,100-some pounds isnâ€™t expected to provide more than an average 16 MPG. One must think Hybrid. Fuel Tank Capacity: 23.0 gal. EPA Fuel economy: 15/18 mpg., 16 avg. Warranty: 48 mths/50,000-miles bumper-to-bumper; 72 mths/70,000-miles powertrain; 48 mths/unlimited miles Roadside Assistance; 12 mths/10,000-miles free scheduled maintenance.